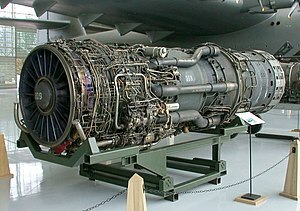 The Pratt & Whitney J58 (company designation JT11D-20) was a jet engine that powered the Lockheed A-12, and subsequently the YF-12 and the SR-71 aircraft. It was an afterburning turbojet with a unique compressor bleed to the afterburner which gave increased thrust at high speeds. Because of the wide speed range of the aircraft the engine needed two modes of operation to take it from stationary on the ground to 2,000 mph (3,200 km/h) at altitude. It was a conventional afterburning turbojet for take-off and acceleration to Mach 2 and then used permanent compressor bleed to the afterburner above Mach 2. The way the engine worked at cruise led it to be described as "acting like a turboramjet". It has also been described as a turboramjet based on incorrect statements describing the turbomachinery as being completely bypassed. The engine performance which met the mission requirements for the CIA and USAF over many years was later enhanced slightly for NASA experimental work (carrying external payloads on the top of the aircraft) which required more thrust to deal with higher aircraft drag. The J58 had its origins in the larger JT9 (J91) engine. It was a 3/4 scale JT9 with a mass flow of 300 lb/s (140 kg/s), down from 400 lb/s (180 kg/s) and known by the company designation JT11. The JT11 was initially proposed to the US Navy with the Navy designation J58. It was also promoted for use on various Navy and Air Force aircraft, e.g. Convair F-106, North American F-108, Convair B-58C, Vought XF8U-3 Crusader III, and North American A3J Vigilante, which never materialized. The J58 was initially developed for the US Navy to power the planned version of the Martin P6M jet flying boat. The P6M started out using Allison J71-A-4 engines and then switched to the Pratt & Whitney J75 as the J58 wasn't ready due to development problems. Upon cancellation of this aircraft, it was selected for the Convair Kingfish and for the Lockheed A-12, YF-12A and SR-71. Other sources link its origin to the USAF's requirement for a powerplant for the WS-110A, the future XB-70 Valkyrie. Analytical predictions for the performance of the original J58 showed that at Mach 2.5 the "exhaust pressure was equal to the inlet pressure, the compressor was deep in surge, and there was no cool air to the afterburner liner that would therefore melt". The first problem was caused by too-high a compressor delivery temperature which didn't allow enough energy to be added in the engine combustor to provide any thrust from the gas generator. All the thrust-producing pressure in the jet-pipe came from ram, as with a ramjet, and none from the gas generator. Fuel for thrust could only be added in the afterburner which became the only source of engine thrust. The speed at which the gas generator produced no thrust would be raised from about Mach 2.5 to about Mach 3 by the patented design changes described below. Beyond that speed the gas generator would become a drag item with, at Mach 3.2, a pressure ratio of 0.9. Even minimum afterburner would not balance the drag. The effect was described qualitatively by Lockheed inlet designer David Campbell "..with minimum afterburner the engine would be dragging on the engine mounts at high Mach numbers." The second was caused by the compressor trying to operate at too-low a corrected speed in an area of its compressor map known as "off-design". The third was caused by the afterburner duct being cooled with too-hot turbine exhaust gas. U.S. patent 3,344,606 describes the changes to the engine that extended the engine's capability to Mach 3.2. They included diverting 20% of the compressor entry air after the 4th compressor stage directly to the afterburner through six external tubes. This allowed the compressor to work properly with adequate surge margin and increased airflow into the compressor. Some of the increased flow left the compressor after the 4th stage as bypass to the afterburner and some left the last compressor stage through the previously-choked area. The increased airflow gave more thrust. The inlet guide vanes were modified with trailing edge flaps to reduce blade flutter and prevent blade fatigue failures. The afterburner was cooled with the bleed air which was 400 °F (220 °C) cooler than the turbine exhaust gas. Not all the oxygen in the bleed air was available for combustion as most of the bleed air was directed into the cooling shroud before entering the afterburner cavity for reheating. The improved afterburner cooling allowed a higher flame temperature which gave more thrust. The engine was completely redesigned, except for the compressor and turbine aerodynamic definitions, so that it would be reliable running for prolonged periods at unprecedented temperatures, not only inside the engine but also surrounding the casings where the controls, accessories, electrical wiring and fuel and oil tubes were located. Two starting methods used during the life of the A-12, F-12 and SR-71 aircraft were: an AG330 starter cart, with two Buick Wildcat V8 internal combustion engines driving a common output shaft, and compressed-air using a small starter adapter. The air-start method superseded the cumbersome "Buicks" when compressed air supplies became available. Any aircraft flying at three times the speed of sound is in a severe thermal environment, both from frictional heating and stagnation ram rise. The fuel was the only heat sink available to the aircraft and after absorbing 40,000 Btu/min (700 kW) keeping everything cool enough, from the crew to the exhaust nozzle area indicator, it was supplied to the fuel nozzles at 600 °F (316 °C). To cope with these very high temperatures a new jet fuel, JP-7 with a low vapour pressure had to be developed. A chemical method for igniting the fuel, triethylborane (TEB), was developed to match its low volatility. TEB spontaneously ignites in contact with air above −5 °C. The engine and afterburner were lit with TEB and the afterburner also had a catalytic igniter which glowed in the hot turbine exhaust. Each engine carried a nitrogen-pressurized sealed tank with 600 cm3 (20.7 ounces) of TEB, sufficient for at least 16 starts, restarts, or afterburner lights; this number was one of the limiting factors of SR-71 endurance, as after each air refueling the afterburners had to be reignited. When the pilot moved the throttle from cut-off to idle position, fuel flowed into the engine, and shortly afterwards an approx. 50 cm3 (1.7 ounce) shot of TEB was injected into the combustion chamber, where it spontaneously ignited and lit the fuel with a green flash. In some conditions, however, the TEB flow was obstructed by coking deposits on the injector nozzle, hindering restart attempts. Refilling the TEB tank was a perilous task; the maintenance crew wore silver fire suits. Conversely, the JP-7 fueling was so safe that some aircraft maintenance was permitted during filling. The chemical ignition was chosen instead of a conventional igniter for reliability reasons, and to reduce mechanical complexity. The TEB tank is cooled with fuel flowing around it, and contains a disk that ruptures in case of overpressure, allowing TEB and nitrogen to discharge into the afterburner. One source of heat had to be brought under control before it entered the fuel heat-sink system. ECS air leaving the engine compressor at 1,230 °F (666 °C) was so hot that ram air at 760 °F (404 °C) had to be used first. Fuel flowing from the tanks to the engines was used to cool the air conditioning systems, aircraft hydraulic fluid, engine oil, accessory drive system oil, the TEB tank and afterburner nozzle actuator control lines. The development of the J58 brought with it some of the most challenging metallurgical development problems experienced by Pratt & Whitney Aircraft up to that time with components operating at unprecedented levels of temperature, stress and durability. New manufacturing techniques as well as new alloys improved the mechanical properties and surface coatings had to be developed to protect component surfaces. Premature cracking of turbine vanes and blades made from what was then conventionally-cast (i.e. equiaxed) Mar-M200, the strongest of the cast nickel-base alloys, was avoided with the development of directionally solidified parts cast in the same material. Directionally solidified Mar-M200 became the strongest cast turbine material in existence at that time and was introduced in production engines. Single crystal turbine blades cast in Mar-M200, giving further improvements in high temperature properties would also be developed through testing in J58 engines. Waspaloy was the most widely used alloy in the engine, from critical high-energy rotating compressor discs to components made from sheet. Although used for turbine discs in other engines it did not have the required properties for J58 turbine discs. Astroloy, the strongest known nickel-base superalloy in the Western world at that time, was used instead. Waspaloy was also used initially for the diffuser case, the part which joins the compressor to the combustor and which contains the highest pressure in the engine. Diffuser case weld cracking led to the introduction of Inconel 718 for this part. The afterburner liner was sprayed with ceramic thermal barrier coating which, together with the cooling air from the compressor, allowed continuous use of the afterburner with flame temperatures up to 3,200 °F (1760 ℃). NASA was loaned 2 SR-71 aircraft for research work. One was modified to flight-test a Linear Aerospike rocket engine and was fitted with thrust-enhanced J58 engines. Engine thrust was increased by 5% to offset increased aircraft drag. The increased thrust came from a throttle push, or exhaust gas temperature uptrim, of 75 °F (42 °C). The increase was limited by the allowable reduction in life of the second stage turbine blades (the life-limiting component) from 400 to 50 hours. The same thrust enhancement studies used for this work also looked at an additional 5% thrust from additional afterburner fuel made possible with oxidizer injection (nitrous oxide). The nitrous oxide rate would have been limited by thermal choking of the nozzle. J58 experience was used extensively in the JTF17 engine proposal for a Mach 2.7 SST due to significant flight time at Mach 2.7 and above. It was also used for subsequent engines developed by Pratt & Whitney, both commercial and military. The next afterburning engine, the TF-30 as installed in the F-111, used an airframe-mounted secondary nozzle with free-floating flaps similar to that used on the SR-71. J58 emissions were measured as part of the NASA Stratospheric Wake Experiment which looked at the environmental impact of using afterburning jet engines for supersonic transports. An engine was tested in an altitude chamber at a maximum condition of full afterburning at Mach 3.0 and 19.8 km altitude. Alternative solutions to combat the adverse effects of high inlet temperature on the aerodynamic performance of the compressor were rejected by the Pratt & Whitney patentee, Robert Abernethy. One of those solutions was used in a contemporary installation. The GE YJ93/XB-70 used a variable stator compressor to avoid front stage stall and rear stage choking. Another possible solution, pre-compressor cooling, was used on the MIG-25. Water/methanol was injected from a spray mast in front of the compressor to lower the intake temperature for short durations at maximum speed. Pre-compressor cooling was also proposed for a Mach 3 reconnaissance Phantom and the Mach 3+ F-106 RASCAL project. The propulsion system consisted of the intake, engine, nacelle or secondary airflow and ejector nozzle (propelling nozzle). The propulsive thrust distribution between these components changed with flight speed: at Mach 2.2 inlet 13% – engine 73% – ejector 14%; at Mach 3.0+ inlet 54% – engine 17.6% – ejector 28.4%. The intake had to supply air to the engine with minimum pressure loss and distortion and at the speed dictated by the engine, namely about Mach 0.4. It had to do this at all flight conditions. The ejector, or secondary, nozzle performed the reverse function of the inlet accelerating the turbine exhaust from about Mach 1.0, as it left the primary nozzle, back up to Mach 3. Mach 3 exhaust velocity is higher than Mach 3 flight velocity due to the much higher temperature in the exhaust. The nacelle airflow from the intake controlled the expansion of the hot engine exhaust in the ejector nozzle. This air flowed around the engine and served also to cool the hot external parts of the engine and to purge any combustible mixtures in the event of a fuel or oil leak in the nacelle. ^ "Factsheets: Pratt & Whitney J58 TurboJet". National Museum of the Air Force. Archived from the original on 2010-04-03. ^ "A Look at the Pratt & Whitney J-58JT11D-20". Atomic Toasters. 2012. ^ "Martin P6M Seamaster". The Aviation History On-Line Museum. Created April 12, 1997. Updated November 2, 2013. ^ http://aviationtrivia.blogspot.com.au/2012/07/the-mach-3-phantom.html "Tails Through Time" J P Santiago Wednesday, July 18, 2012 "The Mach 3 Phantom"
^ Wilkinson, Paul H. (1966). Aircraft engines of the World 1966/67 (21st ed.). London: Sir Isaac Pitman & Sons Ltd. p. 103. ^ Connors, Jack; Allen, Ned (2010). The engines of Pratt & Whitney : a technical history. Reston, VA: American Institute of Aeronautics and Astronautics. p. 325. ISBN 9781-60086-711-8. ^ "Military Turbojet/Turbofan Specifications". www.jet-engine.net. Retrieved 2 January 2018. ^ Graham, Richard H. (1996). SR-71 revealed : the inside story. Osceola, WI, USA: Motorbooks International Publishers. p. 46. ISBN 978-0-7603-0122-7. Wikimedia Commons has media related to Pratt & Whitney J58. U.S. Patent 3,477,455, "Supersonic Inlet for Jet Engines," David H. Campbell. This page was last edited on 20 January 2019, at 01:37 (UTC).